Click here for a video overview on the My Classes V2 control. The updated “My Classes” control brings information to the teacher from a single control. 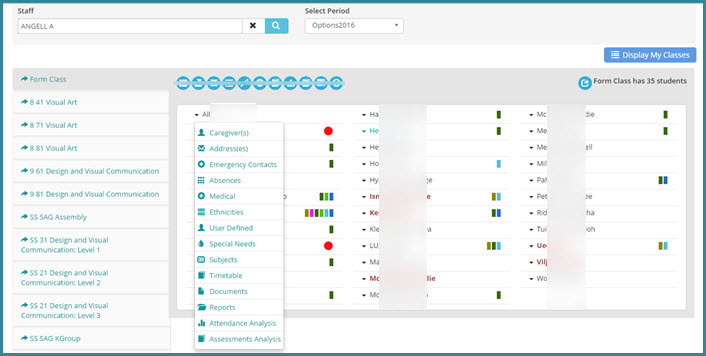 With new one-click access to information, as well as the ability to hover over icons to see additional information, the My Classes v2 is a perfect starting control for most teachers, especially if your school in not using a timetable. A list of subjects assigned to the selected Teacher. The only subjects that will not show in the list are those classified as “Non-Teaching” subjects. The specific “NONT” classification must be used to suppress them from the view. They will still display in timetables if they are set to do so. Icons give you a variety of class related options: Click here for more detail. These icons allow you to add/remove this control from the desktop as well as return to the Home Page. Hover over “Alert Bars” to see student related alerts. Click here for more detail. Students shown in red are departed students who were in the class during the year. This student has one or more unexplained absences in the past 30 days. Hovering will give detail. The Lead teacher brings up the class then uses this icon to bring up the Sharing choice option. This icon remains on the Lead teachers page. Start to type in the name of the staff to share the class with and Search. The names of the staff the class is being shared with are listed, the cross will remove them. The icon to share is removed when a shared teacher accesses the class. Clicking on the individual student’s name gives you a self explanatory drop down as above, linking you to specific information regarding the selected student.